Reading a book of songs without the music is like watching a grand final with the crowd sound turned off. 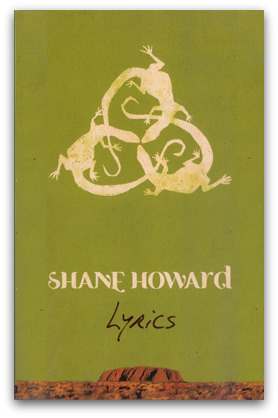 But even allowing for the absence of music, Shane Howard's book of poems and songs is a delight to read. It is beautifully produced by One Day Hill publishers, and accompanies the lyrics with evocative paintings by Theresa O'Brien and Howard himself. The songs are colloquial, but their depth of feeling and grasp of imagery and rhythm engage the reader even without their musical setting. Martin Flanagan introduces the collection with an illuminating foreword. The lyrics record Howard's preoccupations over almost 30 years. He came to public notice in the 1980s through his band, Goanna. He has continued to pursue his music and his commitment to the truth of Australia and its histories, living with Indigenous communities and visiting his ancestral Ireland and deriving the inspiration for his music from the places and people with whom his life is intertwined. The themes of the lyrics are familiar in folk song — love, struggle, freedom, the beauty found in unexpected people and places, love of familiar land and the pain of absence. The point of interest is the singer's individual perspective on these themes. Here, the focus is on constancy. Constancy is a particular kind of faithful and enduring love that must necessarily face and conquer all the intractable forces in yourself, in circumstances and in others that make you give up. Howard's commitment to justice and his companionship with Indigenous Australians has taken him into hard places. His songs form a dialogue in which constancy is sought, feared, loved and finally embodied. Now you know you're not the only one. Give a little now, it's everything can wait. Above all, though, constancy is the flowering of love. Most of these lyrics could be described as love songs, even when they focus on the land, on values or on people overwhelmed by the misery of their lives. Although they tap deeply into the darkness of being human, the songs are sweet and wistful in the hope that animates them. Howard comes from a part of Western Victoria that was settled by Irish immigrants. Their symbols run through his songs. He was also involved in the struggle of the local people to prevent St Brigid's church at Crossley being alienated. When the Catholic parish remained determined to sell it, locals raised enough money to buy it as a community centre. The final poem in this collection celebrates the spirit of the early Catholic community that built the church. To build that church up on the hill. Howard's feeling for the church and his commitment to the campaign to save it embody the world represented in this collection of his songs. His appreciation of the constancy of purpose of earlier generations, his recognition that their constancy makes a claim on their decendants to respond in kind, and the image of the church on the hill that represent both the hoped for end of the uphill struggle and the inspiration to continue the journey, frame a generous and courageous vision. Of course, the albums are the main course but this book is excellent as either aperitif or desert wine. A lovely review, Andrew. What a beautiful sentence, "Constancy is the flowering of love." Thanks for all your writing, so various, so illuminating and so fresh. Constancy is a rarely acknowledged human quality but the love and courage it demands make it one of the strongest expressions of character and commitment. Thanks, Andy, for reminding us of the importance of constancy in both our relationships and our everyday lives. Thank you Andrew for this review. I've recently been revisiting 'Spirit of Place' and am still touched by it. Interestingly, I find myself reconsidering who the narrator and audience of each song is. There is a melancholy about Howard's dialogue with the past and the future. While it lacks the forthrightness of political contemporaries Midnight Oil and Redgum, it speaks nevertheless to our own confusion and uncertainty as we attempt to navigate our way through the past, present and future. Howard may be somtimes be laconic, and often self-deprecating, but his writing is rarely cynical and one is never left with the feeling that his sincerity is motivated by finding a "good hook" or a commercial success. Tony is the working class underdog battling to excel in a sport dominated by private school boys. The temptation for the poor westie Tony to engage in petty crime is a cliché too far, but does help to highlight the social structures that define Tony's world.